Is there a way to move the caret in a text box without using the hard keyboard and without a bunch of single touches? Often when I'm editing in a text box, I'm trying to insert text and specific location or delete text from a specific location. It usually takes me a few touches to get it right, but sometimes I just say screw it, delete the word and and retype. Since I'm usually off by just one character, is there a way to move the caret to left or right by 1 character? Maybe a gesture of some sort? I'm a little unsure if this falls under keyboard software functions(If it does then I'll take a closer look @ the alternative keyboard questions). My device is a Droid which does have a hard keyboard, but I want to be prepared for the day I decide to get phone that doesn't have one. In Froyo and later, there is a "cursor handle" that you can grab and drag to the right location. Now this photo doesnt show it, but the actual cursor is still there blinking too. that handle will also bring up a quick action menu to select text or paste. and once text is selected, you can copy and cut too. This depends on the phone you're using, on my Spica, for example, I can use the directional keypad to adjust the position of the cursor. On phones that have trackballs, the trackball does the same job. Otherwise, the backspace key can be used as a workaround for left-arrow key (delete a few chars, then retype the word you're inserting and retype the deleted chars. Another alternative, if you're typing in English or in one of the supported languages, you can try Swype. Swype is a word-based text input (as opposed to character based), and you typically delete or swipe one word at a time and the correction mode (double tap on the word you want to correct and pick or swipe the new word) make correcting errors a breeze. Providing this as an answer for those who don't want to install a custom ROM and want something close to the stock soft keyboard. The Samsung keyboard and the Swype keyboard have arrow keys you can use for this; see this question. As of 2017 and since 2016, in Gboard (previously known as Google Keyboard), you can swipe along the space-bar to navigate text and move the cursor. MultiLing keyboard has arrow keys in there somewhere. Not the answer you're looking for? Browse other questions tagged keyboard text-input or ask your own question. How use Escape, directional keys on the virtual keyboard? Quick way to enter three dots (ellipsis)? 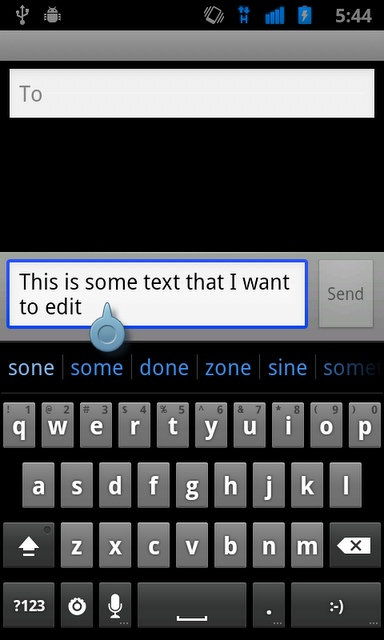 Is there an easier way to type apostrophes on the Droid X keyboard? Is there any way to manually bring up the keyboard? Is there way to make the virtual keyboard appear over any app? In my keyboard, is there a way to advance or backup the insertion point? Is there a way to type German and French characters from the stock keyboard? Is there a way to automatically hide the status bar when the landscape keyboard is open?